The multiplayer portion of GTA V, dubbed Grand Theft Auto Online, is now live on Xbox Live and, according to Sony, the PlayStation Network. The update is 59MB and GTA Online comes via a title update in the PlayStation Network and Xbox Live. 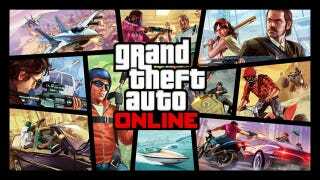 After you install that update, you will unlock GTA Online in the Grand Theft Auto V game menu. Then, you can enter the game with the fourth (bottom) slot in the GTA V character wheel or via an online tab when GTA V is paused. Update: As with many online launches, players are reporting issues, such as unavailable servers or the inability to find other players.